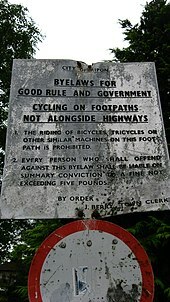 A by-law (bylaw, bye-law, byelaw) is a rule or law established by an organization or community to regulate itself, as allowed or provided for by some higher authority. The higher authority, generally a legislature or some other government body, establishes the degree of control that the by-laws may exercise. By-laws may be established by entities such as a business corporation, a neighborhood association, or depending on the jurisdiction, a municipality. In the United Kingdom and some Commonwealth countries, the local laws established by municipalities are referred to as bye-laws because their scope is regulated by the central governments of those nations. Accordingly, a bylaw enforcement officer is the Canadian equivalent of the American Code Enforcement Officer or Municipal Regulations Enforcement Officer. In the United States, the federal government and most state governments have no direct ability to regulate the single provisions of municipal law. As a result, terms such as code, ordinance, or regulation, if not simply law are more common. Look up bylaw in Wiktionary, the free dictionary. The Merriam-Webster Dictionary indicates that the origin of the word by-law is from the English word bilawe, probably from Old Norse *bȳlǫg, from Old Norse bȳr town + lag-, lǫg law. The earliest use of the term, which originates from the Viking town law in the Danelaw, wherein by is the Old Norse word for a larger settlement as in Whitby and Derby (compare with the modern Danish-Norwegian word by meaning town, or the modern Swedish word by, meaning village). However, it is also possible that this usage was forgotten and the word was "reinvented" in modern times through the use of the adverbial prefix by- giving the meaning of subsidiary law or side-law (as in byway). In either case, it is incorrect to claim that the origin of the word is simply the prepositional phrase "by law." Municipal by-laws are public regulatory laws which apply in a certain area. The main difference between a by-law and a law passed by a national/federal or regional/state body is that a by-law is made by a non-sovereign body, which derives its authority from another governing body, and can only be made on a limited range of matters. A local council or municipal government derives its power to pass laws through a law of the national or regional government which specifies what things the town or city may regulate through by-laws. It is therefore a form of delegated legislation. Within its jurisdiction and specific to those areas mandated by the higher body, a municipal by-law is no different than any other law of the land, and can be enforced with penalties, challenged in court and must comply with other laws of the land, such as the country's constitution. Municipal by-laws are often enforcable through the public justice system, and offenders can be charged with a criminal offence for breach of a by-law. Common by-laws include vehicle parking and stopping regulations, animal control, building and construction, licensing, noise, zoning and business regulation, and management of public recreation areas. Under Article 94 of the Constitution of Japan, regional governments have limited autonomy and legislative powers to create by-laws. In practice, such powers are exercised in accordance with the Local Autonomy Law. By-laws therefore constitute part of the legal system subordinate to the Japanese constitution. In terms of its mandatory powers and effective, it is considered the lowest of all legislation possible. In the United Kingdom, by-laws are laws of local or limited application made by local councils or other bodies, using powers granted by an Act of Parliament, and so are a form of delegated legislation. State government authorities create By-laws as a type of "statutory rule" under an empowering Act, and are made by the State governor. Local government by-laws are the most prevalent type of by-law in Australia, and control things from Parking and Alcohol in parks to fire regulations and zoning controls. In New South Wales these by-laws are called ordinances and Zoning Controls are called Environmental Planning Instruments created under the Environmental Planning and Assessment Act. Numerous specific institutions, including universities, are also empowered to make by-laws by their establishing legislation. By-laws of a company or society are created as a contract among members, and must be formally adopted and/or amended. Strata Title was developed in Australia and by-laws of body corporate are also empowered by state legislation. These are the main type of by-law most people come into contact with on a regular basis as they control what people in Strata title housing can do in their own homes. The most well known of these is the "no pets in flats" rule. Corporate and organizational by-laws regulate only the organization to which they apply and are generally concerned with the operation of the organization, setting out the form, manner or procedure in which a company or organisation should be run. Corporate by-laws are drafted by a corporation's founders or directors under the authority of its Charter or Articles of Incorporation. By-laws widely vary from organization to organization, but generally cover topics such as the purpose of the organization, who are its members, how directors are elected, how meetings are conducted, and what officers the organization will have and a description of their duties. A common mnemonic device for remembering the typical articles in by-laws is NOMOMECPA, pronounced "No mommy, see pa!" It stands for Name, Object, Members, Officers, Meetings, Executive board, Committees, Parliamentary authority, Amendment. Organizations may use a book such as Robert's Rules of Order Newly Revised for guidelines on the content of their by-laws. This book has a sample set of by-laws of the type that a small, independent society might adopt. The wording of the by-laws has to be precise. Otherwise, the meaning may be open to interpretation. In such cases, the organization decides how to interpret its by-laws and may use guidelines for interpretation. Usually one of the last sections in the by-laws describes the procedures for amending them. It describes who can amend them (usually the membership, but it could be the organization's board of directors), how much notice is needed, and how much of a vote is needed. A typical requirement is a two-thirds vote provided that previous notice was given or a majority of all the members. In parliamentary procedure, including Robert's Rules of Order, the by-laws are generally the supreme governing document of an organization, superseded only by the charter of an incorporated society. The by-laws contain the most fundamental principles and rules regarding the nature of the organization. It was once common practice for organizations to have two separate governing documents, a constitution and by-laws, but this has fallen out of favor because of the ease of use, increased clarity, and reduced chance of conflict inherent in a single, unified document. This single document, while properly referred to as the by-laws, is often referred to as a constitution or a constitution and by-laws. Unless otherwise provided by law, the organization does not formally exist until by-laws have been adopted. In some countries, trade unions generally have constitutions, which govern activities of the international office of the union as well as how it interfaces with its locals. The locals themselves can set up their own by-laws to set out internal rules for how to conduct activities. In other countries, such as the United Kingdom, union by-laws are sometimes a subset of the union's constitution or implement the union's rules in more detail. Wikimedia Commons has media related to By-laws. ^ "Definition of BYLAW". www.merriam-webster.com. Retrieved 2017-11-05. ^ Subordinate Legislation Act 1989 (NSW) s 3 Definitions. ^ Environmental Planning and Assessment Act (NSW). ^ By laws in the legaldictionary.com. ^ Strata Schemes Management Act 1996 (NSW) sections 41-60. ^ Strata Titles Act 1985 (WA). ^ Thomson, Jimmy (June 19, 2013). "Apartments go to the dogs". News.domain.com.au. ^ Thomson, Jimmy (July 2, 2013). "No dog rule overturned". News.domain.com.au. ^ a b Geitner, Frank (December 2, 2014). "Point of Order". Newport News Times. Newport (Oregon) News Times. Archived from the original on January 6, 2016. Retrieved 2016-01-06. ^ Robert, Henry M.; et al. (2011). Robert's Rules of Order Newly Revised (11th ed.). Philadelphia, PA: Da Capo Press. p. 13. ISBN 978-0-306-82020-5. ^ Robert 2011, pp. 588–591: "Some Principles of Interpretation"
^ "GMB Union rulebook – see rule 11.8 as an example" (PDF). Gmb.org.uk. Archived from the original (PDF) on 2010-08-03.